A continuing education course about bow hunting? Why not?! Bow hunting ranks higher today in participation than almost any other form of hunting—besides whitetail gun hunting. 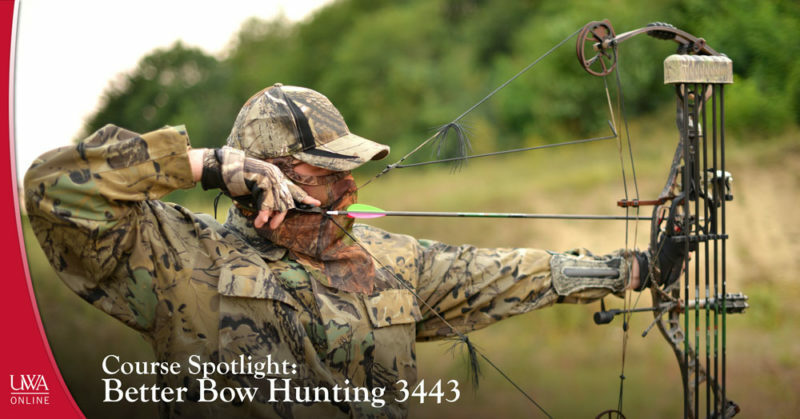 In Better Bow Hunting 3443—an online continuing education course through UWA Online, participants will learn helpful tips and strategies for successful bow hunting and the skills they need to know to get the most out of their equipment. Better Bow Hunting 3443 will teach students specific information about high-performance gear, give shooting advice, explain bow hunting techniques and other useful information for staying on top of their game while in the archery field. This independent-study course will feature real-life situations and give bow hunters the push they need to hone their bow hunting skills. Is your broadhead too light? Should you shoot a shorter vane? The tuition for this course is $195. As an independent-study, for Better Bow Hunting 3343 students will be provided the online materials needed to complete the course. A student helpdesk will be available for technical support throughout the enrollment period. Registration closes on Friday, December 15, 2017. Sharpen your bow hunting skills with UWA Online Continuing Education e-Learning today! Click here to register for this course, or visit www.uwa.edu/ce to browse our other course offerings. A space means different things to each of us, and we tend to occupy space differently from one another; for example, the kitchen table is for eating dinner, but a mom might use that surface to make plans or work on bills. Successfully setting up your own home office space is critical for those who have the opportunity to work from home—including participants of UWA Online Continuing Education e-Learning courses. Having a clean, effective space to work can give you productivity you may lack in other areas—yet it’s good to remember space affects people differently, so what may seem like a great place to work for you may be different from your friend. 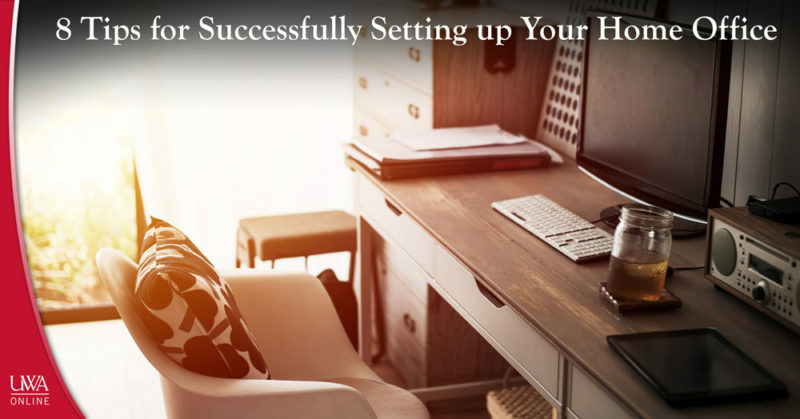 When it comes to setting up your home office, knowing the ways to do so successfully is important. Position your desk near a window. According to a study by the Northwestern Medicine and the University of Illinois, natural lighting improves not just productivity in the office, but also outside the office—such as sleep and physical activity. In short, natural lighting benefits your mental health. When setting up your home office, position your primary work space near a window with plenty of natural lighting—if you can—and absorb that sweet, vitamin D-producing sunlight! Use a comfortable chair. Discomfort can prevent you from working at full capacity and make the job miserable. Avoid this misfortune by using an ergonomic chair that supports your back, reduces neck problems, and accommodates your work, and you will go far in setting up your home office. Make and enforce hours in the office. Whether you need to work or just get some studying in, confining your work activities to dedicated office hours will help keep you on task and minimize long periods of distractions and breaks. Set up work breaks! Whether it’s leaving the office for your own built-in lunch hour or a 15-minute stretch break, allowing yourself to push away from your work for a breather can greatly benefit your mood and productivity. When creating and enforcing your work hours, keep this tip in mind! Be organized by keeping around only products you need. Having mostly necessities within reach will keep you stay on task by helping you quickly find things you need. Some people live in clutter and work better in it, but minimizing mess can aid in a stress free, efficient home office. Reduce distractions. This tip is similar to tip #5 in that by keeping around only products you need, the fewer distractions will exist to prevent you from working or studying. If possible, have a dedicated work computer and load it only with programs you need for work, or use a dedicated work browser without your usual entertainment and social media websites. Refrain from having a TV in your office unless you’re the kind of person to work better with some kind of background noise. Surround your office with positivity and personality! Give your office a personal touch that says, “You!” Decorate it with pictures of family and friends, or hang up posters from your favorite movie or band. Get some plants and place them around the office for some added green! (Even if the plants are fake because you don’t have a green thumb…) Hang a motivational picture above your desk to read when you’re feeling down! You should be able to like sitting for hours in your home office or study. Separate your home office and your living spaces. This idea is simple: if you design your office to be separate from your living spaces, then you will do work in your office and live in your living space. Sometimes, that concept isn’t completely possible, because you don’t have a spare room to dedicate to your office, or you have no choice but to pick out a corner of your living room or bedroom to be your new office space. However, if you can find some way to make it feel separate from you’re the rest of the living space that your office shares, then you can still afford to make your office feel like an office and not just an extension of your living room! And last but not least, once you’re successfully setting up your home office or study, take advantage of the comfort and productivity and stick to it! Continue following the UWA Continuing Education blog for more tips on how to be successful as an e-learner! To learn more about our course offerings or to register for courses, visit www.uwa.edu/ce! Livingston and the University of West Alabama are set in a rich historical context as part of the state’s Black Belt Region. Named for its dark, fruitful soils, the Black Belt encompasses between 12 and 21 counties in the central part of Alabama, and it is geographically part of the larger Southern Black Belt, which stretches from Maryland to Texas. Not only is Alabama’s Black Belt rich in terms of agricultural opportunity, but the culture of the region proves distinct—with its own story to tell. In an effort to help tell the story of Black Belt’s past, present and future, the University of West Alabama established the UWA Black Belt Museum. Located in the renovated McMillian Bank building in downtown Livingston, the UWA Black Belt Museum is housed within the Division of Economic Development and Outreach at the University of West Alabama. Through this partnership, the museum strives to act as a connection between the university and the community—and to provide students a way to use their academic interests to actively better the local area through the museum’s programs. While the Black Belt region is the primary focus of these collections, they also incorporate artifacts and data on a statewide level, such as the Alabama Plant Atlas—a comprehensive and searchable database of plants found throughout Alabama. A self-proclaimed “museum without walls,” the majority of the UWA Black Belt Museum’s initiatives are conducted via programming all over the Southeast. The UWA Black Belt Museum supports a selection of programs for the university, local schools and the public that represent a range of educational interests. They include guided tours of Fort Tombecbe and other local historical sites, participation and group presentation activities, traveling living history programs for schools and guided tours of the museum’s exhibits. Staff of the UWA Black Belt Museum are currently conducting research regarding fossil discoveries and regional natural and human history in the region, as the Black Belt is one of the most fruitful fossil resources in the world. Also happening this summer, on August 26, the Center for the Study of the Black Belt will co-host the Alabama-Mississippi Bicentennial Genealogy Conference: Making the Most of Every Moment at UWA. Individuals representing nine states have currently registered for the event. Livingston and the University of West Alabama are fortunate to have the UWA Black Belt Museum as a resource for historical preservation and education in our local portion of the Black Belt region! 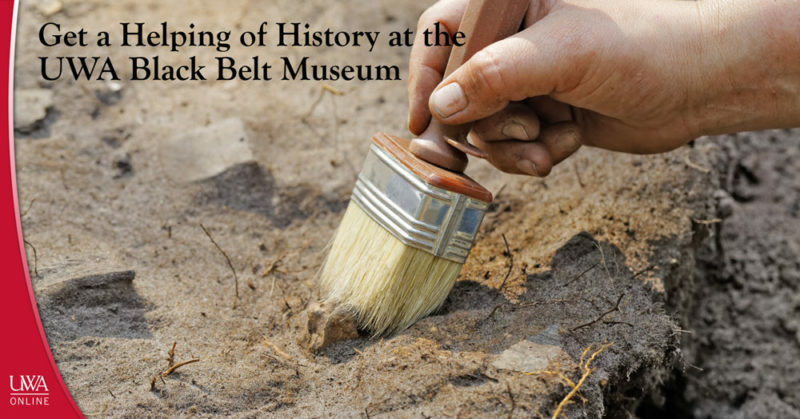 To learn more about what the UWA Black Belt Museum has to offer, visit www.blackbeltmuseum.org. Interested in furthering your education via our online programs? Browse our course offerings at www.uwa.edu/ce! You can register for our eLearning courses from anywhere that you have access to a computer and an internet connection. Looking to improve environmentally-friendly habits in your daily routine? Register for Going Green 3500—a continuing education e-Learning course from the University of West Alabama Online! Students enrolled in this course will learn budget-friendly practices that encourage healthier, greener lifestyles that will benefit not just students and their families, but the environment that we call home. As concern for the safety and health of planet Earth peaks public interest, it is vitally important—as it always has been—for individuals and their families to take part in whatever ways they can to reduce their carbon footprint: every little bit helps. 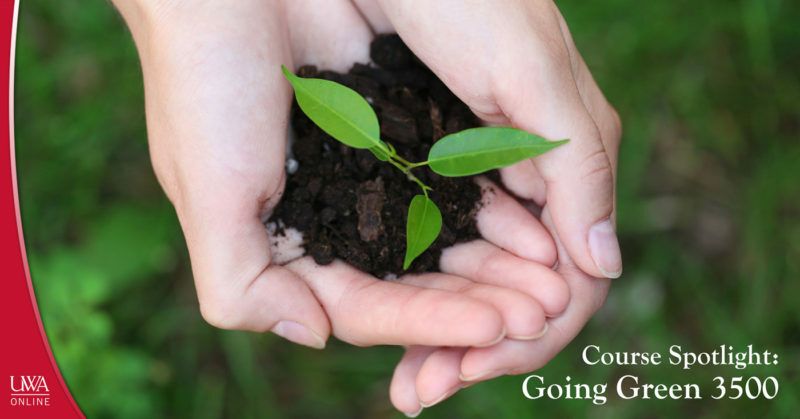 Students of Going Green 3500 will learn that significant change can be enacted through simple actions—for both our health, the environment, and our budgets. and curtail their environmental impact! Module 1: What Does it Mean to be Green? The online-taught course is an independent-study, providing students with the online materials they need to learn and succeed within their own schedules. An available student helpdesk will provide technical support during enrollment. Enrolled students will need Internet access such as broadband or high-speed Internet connection. Other hardware requirements can be found on the course information page, as well as registration information. The course tuition is $195.00. Click here to register for this or other UWA Online Continuing Education e-Learning courses! Don’t forget visit us at www.uwa.edu/ce and follow our UWA Continuing Education blog! Depending on where you have worked, the following scenario may seem familiar to you. You are in the breakroom or standing next to your company bulletin board, and you notice a laminated poster outlining “OSHA Guidelines.” You may have glazed over it, but don’t be too quick to pass it off as unimportant. A part of the United States Department of Labor, OSHA, or, the Occupational Safety and Health Administration, is an entity that was created to assure safe and healthy working conditions by setting standards and providing training, education and other resources. Though OSHA itself does not address training or certification requirements, meeting several OSHA standards requires that employers train their employees on specific health and safety issues with regard to their jobs. If you are looking for OSHA-related CEUs, check out these OSHA courses you can take with UWA Online! Healthcare workers, emergency response persons, lab personnel and others who may be exposed to blood through their daily work can benefit from this course. OSHA sets several standards regarding worker safety and potential risks from bloodborne pathogens, which will be covered in OSHA Bloodborne Pathogens 3551. Register here. This course will help workers at construction worksites identify hazards that can lead to occupational fatalities caused by falls, electrocution, falling objects and other scenarios. The idea in helping point out these potential hazards is to help construction site workers protect themselves and others. Register here. Designed for general audiences, this course intends to help employers create effective emergency action plans and educate employees about what to do in various emergency situations. The course will help employees feel better prepared to handle emergency scenarios efficiently. Register here. In this instance, ergonomics refers to matching up workplace conditions and job demands to the abilities of one’s employees. Participants will learn how to execute tasks in such a way that they are not detrimental to the physical and mental well-being of employees. OSHA Ergonomics 3554 will cover ergonomics, how to apply ergonomics and OSHA’s role in enforcing ergonomics in the workplace. Register here. This course will cover OSHA’s standards for workplace health and safety and teach participants how to help prevent issues that can be injurious to a worker’s health or safety. As an organization, OSHA works to reduce workplace accidents by educating employers and employees about proactivity concerning workplace injury deterrence. Learn how to create and implement a plan promoting this type of proactivity with OSHA Safety & Health 3555. Register here. In OSHA Workplace Violence 3556, participants will acquire critical knowledge of workplace violence issues including policies, awareness, prevention, response and preparedness. The aim of the course is to help employees recognize instances of workplace violence and work to implement safe practices to prevent it. Register here. Each of these OSHA courses you can take with UWA Online costs $40 and are structured as independent study courses. Students will be provided with the online material needed to successfully complete the course, and technical support will be available to participants during the enrollment period. Help create a safer workplace for yourself, your employees and/or your coworkers with these OSHA courses you can take with UWA Online! To view UWA Online Continuing Education e-Learning’s other course offerings, visit www.uwa.edu/ce! For many in the South, despite the substantial heat, summer is associated with time spent outdoors—from days passed poolside to nights around a campfire. For others, a view from the bank or a boat with rod and tackle in hand sounds more like the ideal summer afternoon. Fortunate for residents and visitors of Sumter County in west Alabama, the area is home to some of the best fishing spots in the state. 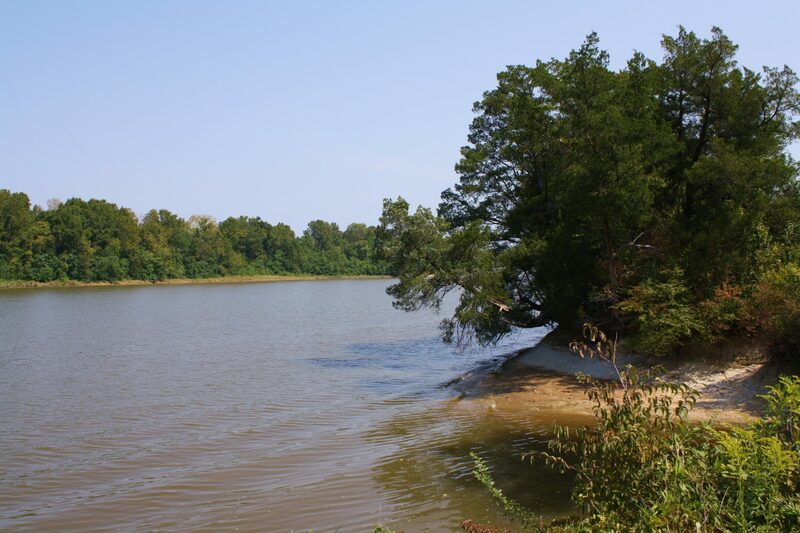 With several natural bodies of water including the Tombigbee River and an abundance of privately-owned fishing opportunities, anglers in Sumter County should not be disappointed. 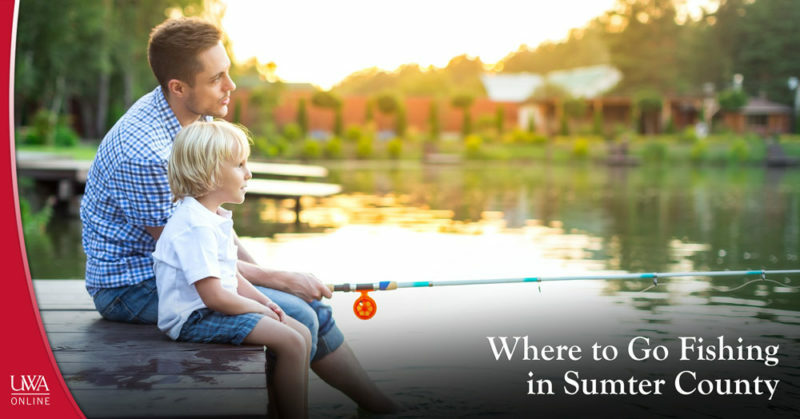 Wondering where to go fishing in Sumter County? Check out these spots. Located on the University of West Alabama’s campus, the 54-acre Lake LU is open to the public for fishing and boating three days a week. 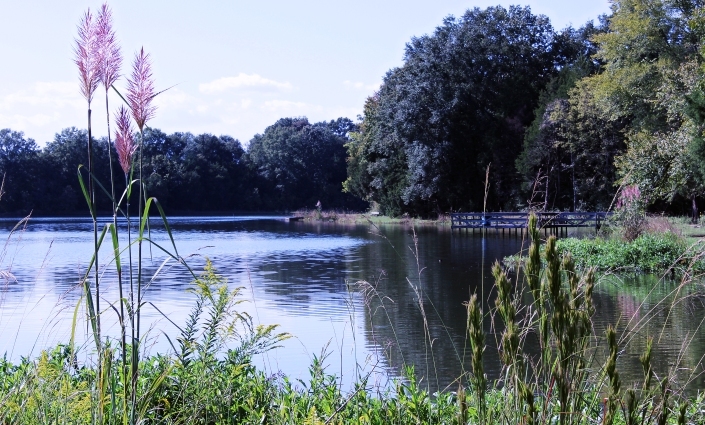 The lake is surrounded by nature trails for hiking, running, bird watching and more. 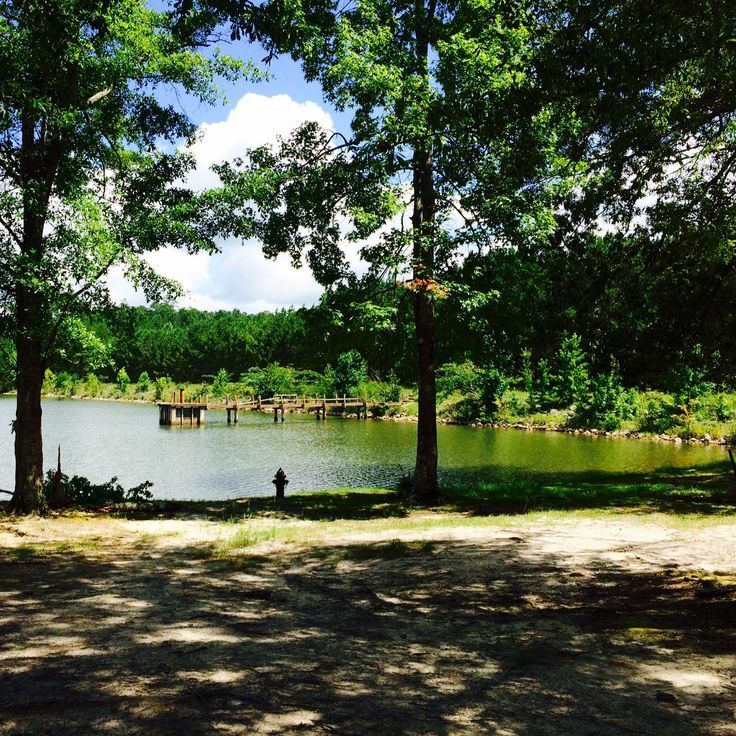 Sumter Pond is located 4.2 miles from Livingston near Hixon, Alabama. Lake Louise is located 2.2 miles from York in Sumter County. Boasting the best trophy bass fishing in the Southeast, Dream Lake Lodge is located in Livingston and features two lakes stocked with Florida, Tiger and F1 Bass. The lodge is available to rent for day trips or overnight stays. Go to the website. 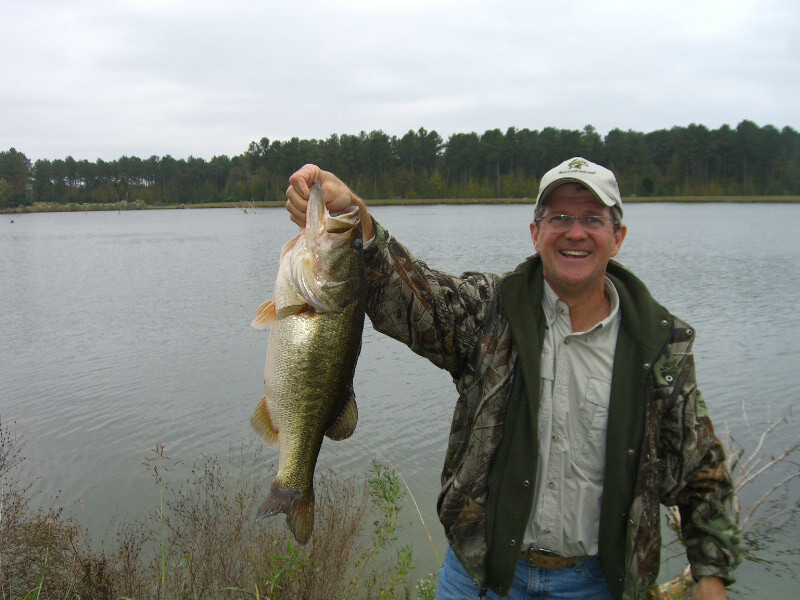 Located in Livingston, Jug Branch Lodge offers four lakes that have been extensively managed for trophy fishing. Fish for Blue Gill, Shell Cracker, Copper Nose, Florida Bass or F1 Bass. Go to the website. P-Arrow features eight lakes across 110 acres that are stocked with Northern, Florida and hybrid largemouth bass in addition to copper nose, blue gill, shell crackers and crappie. The largest lake on the plantation, which is located in Livingston, is the 33-acre Horseshoe Lake. Go to the website. Flowing from the Fall Line Hill region of West Alabama to the lower Coastal Plain, the Tombigbee River offers fishing opportunities for species like catfish, largemouth bass, crappie and bream. The river flows through Sumter County and along the borders of Marengo/Choctaw and Clarke/Washington counties. Public boating docks on the Tombigbee are located in Epes, Gainesville and Belmont. 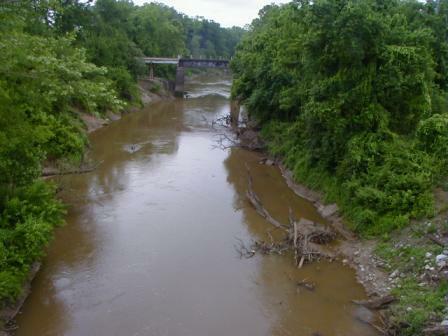 The Sucarnoochee River is a tributary of the Tombigbee River and flows through Sumter County. In deciding where to go fishing in Sumter County, keep in mind that possessing an Alabama fishing license is a requirement for persons 12 and older. In addition, you should always first contact the local Fish and Wildlife department to make sure that the lake, river, pond or stream is open to the public for fishing. For more information on Alabama’s fishing regulations, visit the Outdoor Alabama website. Now that you know where to go fishing in Livingston, it’s time to plan your next fishing trip! For more insight into the life and culture of Livingston, Sumter County and the University of West Alabama, continue to follow the UWA Online blog! To learn more about UWA Online’s Continuing Education e-Learning programs, visit www.uwa.edu/ce! Whether it’s to an exotic destination across an ocean or a landmark across a state line, traveling is something that keeps many of us sane. Its ability to break up our daily routines and open our eyes to new people, places and things is what makes it so desirable. That being said, travel and tourism is a $4 trillion industry and growing—making it a potentially profitable and rewarding field to work in. In the Travel Agent Training course of study, students will acquire the skills they need to be successful working in the travel industry. 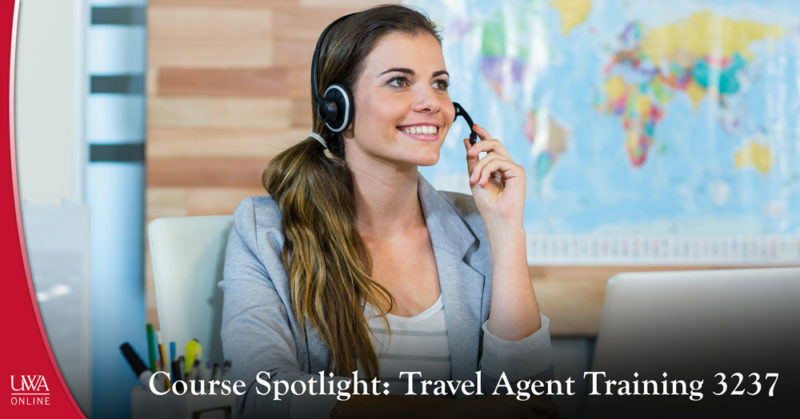 The instructor for this grouping of courses is Lisa Wade, who began her travel career as a Corporate Travel Agent for Murdock Travel Management. From there, she became the school director for The Center for Travel Education, now called TravelCampus. In recent years, she has served as the Director of Curriculum Design/Development for TravelCampus and has played an instrumental role in developing online courses for travel and tourism companies. She has also headed all instruction for Travel Campus, ASTA and IATA online courses. If you are interested in getting involved in a travel-related career, the Travel Agent Training certificate via UWA Online Continuing Education e-Learning is a great place to get off the ground! Visit www.uwa.edu/ce and search “travel agent training” to register today! The 4th of July is perhaps best known for the holiday’s dazzling firework displays across the country—besides historical independence, of course. However, there’s more to these festive shows than their brilliance. Ever been curious about the objects lighting up the night sky with colorful shapes and drifting smoke? Fireworks have chemistry—and history!—and we want to give you a taste of that science and history so when you go watch the fireworks tonight, you can enjoy the display with new context and renewed curiosity! 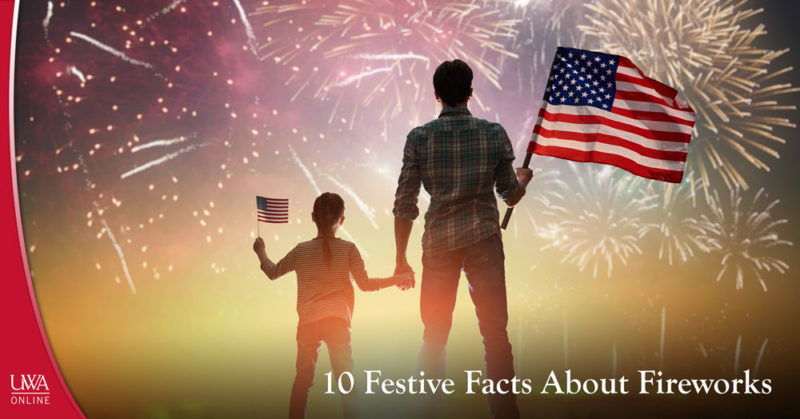 Check out these festive facts about fireworks! The current leader in the production and export of fireworks is China, and is believed to be the reason why firework shows are a popular form of celebratory entertainment. The Chinese also discovered how to make the earliest firecrackers: bamboo stalks roasted until an explosion is produced by the bamboo’s natural air pockets. Later, they put gunpowder in bunches of bamboo stalks, threw the shoots into a fire, and waited for inevitable explosion—rather, a small bang. The pyrotechnics of fireworks is just simply chemistry–and a delicate process. The primary ingredients inside the hardened cardboard shell are fuel, an oxidizer to support combustion, a colorant to provide that brilliant hue, and a binder to hold everything together. A timed fuse sets off the explosion after the firework has been rocketed into the air. The cool shapes fireworks make in the sky are determined by how the pyrotechnic stars are arranged inside the cylindrical casing. Pyrotechnic stars are pellets with all the ingredients needed for a colorful combustion! The sounds produced by fireworks depend on the type of chemicals and the firework casing. The characteristic loud bang comes from the gases inside the casing rapidly expanding and popping the cartridge. The crackling sound comes from slow-heating chemicals inside such as iron oxide. A whistling sound comes from a firework with a narrow tube. Walt Disney World consumes the most fireworks in the United States, likely because of its nightly firework shows. China may be responsible for the invention of fireworks, but it was in Italy where fireworks became known for their vibrant colors. In 1830, Italian pyrotechnic artists began to create their fireworks with trace amounts of color-changing chemicals. The previously uncontrolled firework detonations lead to the formation of the Society for the Suppression of Unnecessary Noise, which in turn lead to nation-wide regulations regarding the use of fireworks and is why different states have different firework ordinances. Fireworks aren’t particularly environment-friendly due to the associated chemicals and reactions produced during explosions. Furthermore, fireworks aren’t recyclable, and you should dampen the explosives and call your local waste department before discarding unused fireworks. The Consumer Product Safety Commission (CPSC) reports that by 2013, 11,300 injuries were caused by fireworks, and more than half occurred around the 4th of July. Now that you are familiar with these facts about fireworks, get out there and enjoy them! Be safe this 4th of July when it comes to fireworks. Have fun, but don’t forget mindfulness! UWA Online Continuing Education wish our readers a happy 4th of July! For more information about UWA Online Continuing Education e-Learning, call us at 205-652-5110 or visit www.uwa.edu/ce! This week, families and groups of friends across the country will spread out their blankets, unlock their tailgates, prop up their lawn chairs and turn their eyes to the sky for the most explosive nighttime show of the year. After a day meant to celebrate America’s independence with barbecues, yard games and dips in the lake, river or pool, fireworks are the cherry on top—and a spectacle that many dub the literal highlight of the holiday. 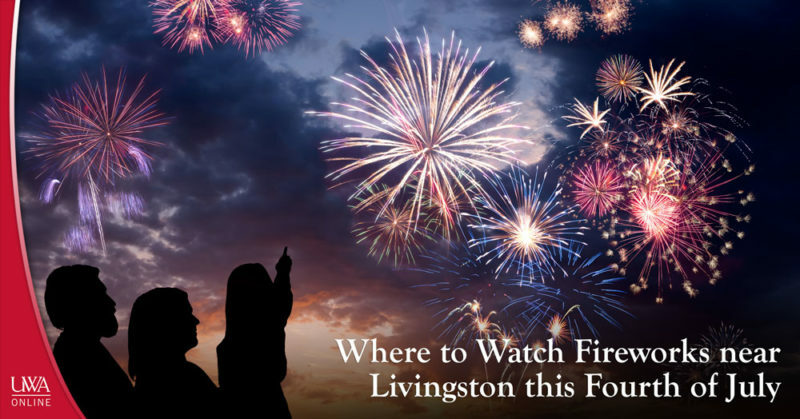 If you’re wondering where to watch fireworks near Livingston this Fourth of July, check out this list of fireworks displays (and holiday celebrations) happening in the area. >Freedom on the River, Demopolis, Ala.
Demopolis’ annual Freedom on the River event will take place July 4, 2017, in downtown Demopolis and along the Tombigbee River from 3 p.m. to 9 p.m. Enjoy a fireworks show on the river with bands, food vendors and a children’s patriotic parade. >Independence Day Celebration, Tuscaloosa, Ala.
Another riverside celebration happening in West Alabama this Fourth of July is Tuscaloosa’s Independence Day “Celebration on the River,” starting at 6 p.m. The celebration will feature the Tuscaloosa Symphony Orchestra, ParaKids Zone, fireworks and more. >City of Meridian July 4 Celebration, Meridian, Miss. A celebration of Mississippi’s bicentennial along with America’s Independence Day coincide this Fourth of July at Meridian’s Bonita Lakes with gates opening at 3:30 p.m. Attendees at this free event will enjoy live music, food vendors and a spectacular fireworks display starting at 9 p.m.
As your eyes twinkle to the light of loud booms this Independence Day, take a minute to reflect on what it means to live with the freedoms that so many have fought to preserve. Happy 4th of July from UWA Online! To learn more about UWA Online’s Continuing Education e-Learning programs, visit us at www.uwa.edu/ce! The credibility of a website is often determined by the craftsmanship of its design and usability, and in a digital era saturated in digital competition, becoming an effective web designer is essential. Web Design 4179 will teach students the basics of HTML, CSS, and web design. The course will guide students through the process of learning basic coding without need for prior knowledge. 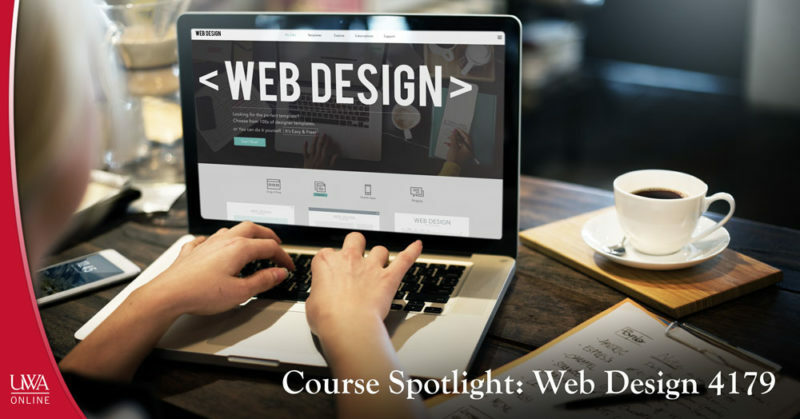 Students will complete the course with a working knowledge of web design such as HTML, CSS, page layout techniques, text formatting, and graphic design implementation. The completion of Web Design 4179 will allow students to advance in their web design studies, allowing them to become proficient and competitive web designers. This course is useful for prospective web designers and programmers. select the most appropriate web development software. To view the course outline, register for the class, and view additional course information, click here! After registering for the class, you can enter the online classroom through a username and password. You can participate at any time—the classroom is open each day of the week, all day, with no real-time requirements. However, students are encouraged to post on the discussion forum 2-3 times a day, and the instructor will log on at least once a day to respond to questions and discussion. 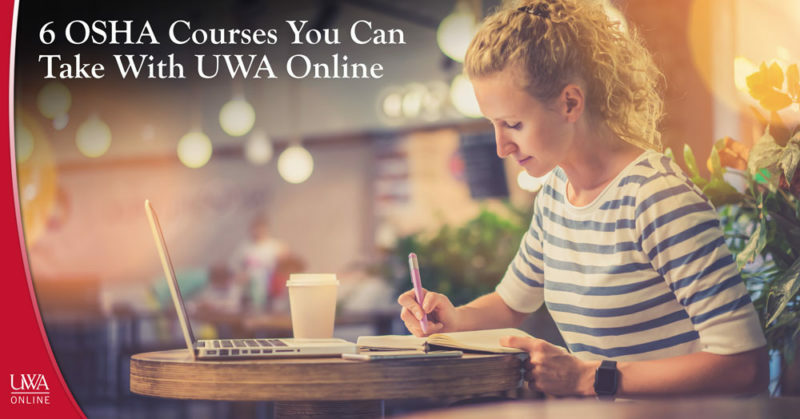 Click here to browse for other UWA Online Continuing Education e-Learning courses. Don’t forget visit us at www.uwa.edu/ce and follow our UWA Continuing Education blog!